As part of my work on Sugar&Splice, I regularly search through PubChem for biopolymers where we recognise most of the components but maybe miss one or two. My typical approach is to extract the SMILES strings of these monomers, and consider the most commonly occuring ones as candidates for addition to our internal library. When I do this, I try to avoid making up our own names for monomers, and instead defer to IUPAC or vendor catalogues or what’s commonly used in the field. But identifying what’s commonly used in the field isn’t always obvious from a few Google searches. In a talk I presented at the Fall ACS in Boston (see below), I described a text-mining approach (using LeadMine) to determine commonly-used monomer names that we were missing. The talk focussed on peptides, but the principle is general: I took a corpus of scientific text (e.g. 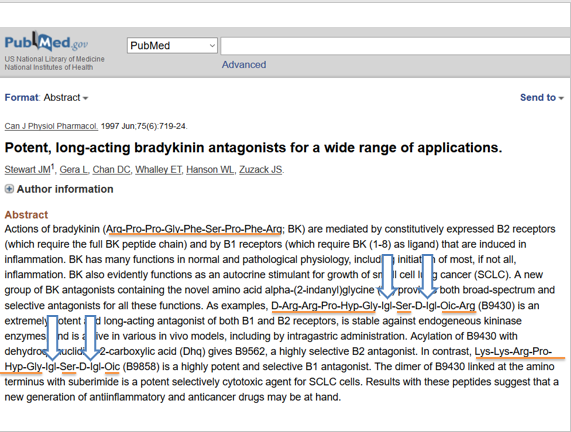 US patents or PubMed abstracts) and searched for matches to a peptide line notation grammar – you can think of this as a regular expression that matches IUPAC condensed notation like H-Ala-Cys-OH. Next, I looked for gaps between text that is recognised (see the image below) and extracted the text. I then looked for the most frequently occurring phrases and added them to our internal library. These were often synonyms of monomers we already had, but not always. The same principle can be applied to terminal modifications (look at the text that occurs before or after matches) and side-chain modifications (look for text within parentheses after an amino acid). This approach worked really well. However, some care is needed to ensure that different peptide scientists really mean the same thing when they use the same term. An example is “Dpa”, which it turned out meant diaminopropionic acid to some people but 3-(2,4-dinitrophenyl)-2,3-diaminopropionic acid to others.